The Google Assistant on Google Home is getting a new feature today that may sound rather familiar to anybody who has ever owned an Amazon Echo. You can now use your Home to order everyday essentials like toilet paper and shampoo from the company’s Google Express partners. Those partners include the likes of Costco, Whole Foods, Bed Bath & Beyond, Fry’s, Guitar Center, Petsmart and Walgreens. The exact list of partners depends on where you live, but some are available nationwide. Depending on the area you live in, Google Express may also either offer same-day service (mostly in larger metro areas), overnight service, or only 2-day or 3-day service. Google offers a $95/year (or $10/month) membership for Express. Otherwise, delivery fees start at $4.99. 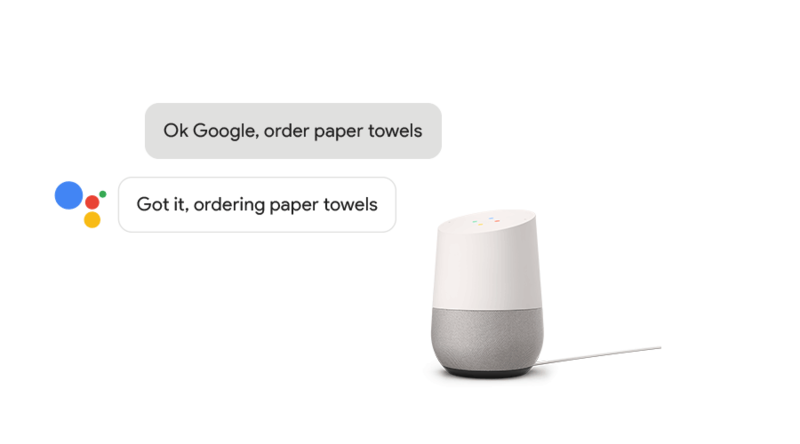 To buy something, you only have to say “OK Google, order paper towels” (and if you don’t have a Google Home, then you can obviously order one through the Google Express website, too, together with some Kirkland Signature Unsalted Nuts). Google notes that the selection of items available through voice ordering may be slightly different from the one on the Google Express homepage. To do any of this, though, you will have to have to set up a payment method in the Google Home app first. The Google Assistant on Home will allow you to buy anything from $4 to $100. To promote this new service, Google won’t charge any service fees when you’re ordering from Google Home until the end of April 2017. It’s worth noting that this feature is only available on the Google Assistant on Home. When I asked the Assistant on my Pixel to order me some fresh paper towels, it gave me a link to Amazon’s web store. This new feature fills an obvious gap in Google Home’s capabilities. Amazon’s Alexa on its range of Echo devices didn’t know a lot of things in its early days, but it quickly learned how to let you order stuff from the company’s store. Google isn’t Amazon and most people don’t equate it with an online shopping experience, though, so it remains to be seen how many users this new service will actually get. For most shoppers, Amazon is now synonymous with online and voice shopping, after all.